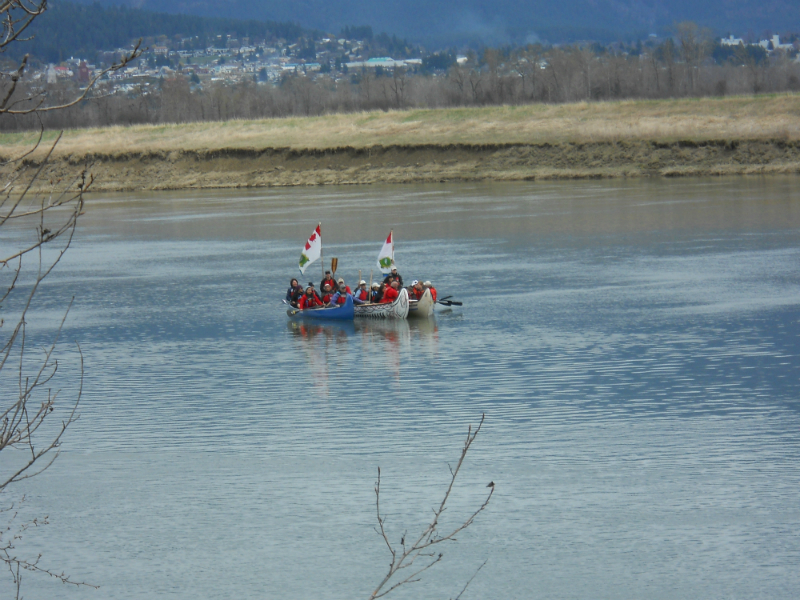 In March of this year, 23 self identified aboriginal youth as well as Ktunaxa youth stepped forward to train for a 73 km canoe trek from Bonners Ferry Idaho to Akunuk (Rykerts). The youth received intense training on land, in the gym, & in the water, to become physically & mentally prepared for the journey. The journey from Bonners Ferry to Akunuk (Rykerts) on the Kootenay River paid tribute to one of our village sites that is now an international boundary. Of the 23 youth, 9 remained committed to the team & journey. The team trained on a weekly basis since March & on June 19/14, Team Ktunaxa departed from Bonners Ferry. We were joined by members of the Kootenai Tribe of Idaho for a portion of the journey. Tribal Chairman Gary Aitkin Jr & a small contingent of Kootenai Tribe of Idaho members were extremely supportive & their youth joined ours in unity. 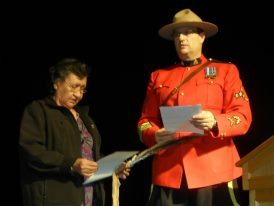 Together, we asserted our sovereignty in the waters of the Kootenay River in our ancestral home lands. On June 20/14, Team Ktunaxa arrived at Akunuk where we were greeted by the Eagle Bear Spirit drum group, elders, LKB members, & citizens of the Creston Valley. The last 2 hours of the trek were the most difficult as the team encountered extreme wind & waves on the river. On the shores of Porthill stood members of the Kootenai Tribe of Idaho cheering our youth on. Near Rykerts were Lower Kootenay Band members encouraging the team & welcoming us home. Team Ktunaxa would like to thank the Ktunaxa Nation Council, Columbia Basin Trust, RDCK Area A, RDCK Area B, Kootenai Tribe of Idaho, Town of Creston, Mayor Ron Toyota, & the Yaqan Nukiy Pow Wow, for making this event possible. Aboriginal Day 2014 was a day of pride & the presence of our ancestors was felt throughout the journey. We hope to make this an annual event but require the support of our entire Nation. We hope to have canoes represented from all of our member communities.